Cyclones from the Bay of Bengal in the northeast of India frequently cause extensive damage. This cyclone took 60,000 lives and flooded the entire city of Calcutta. On October 5, 1864 most of the city of Calcutta, India, was flooded and destroyed by a cyclone. Sixty thousand people were killed at once and many thousands of others died later from the sicknesses and diseases that followed. The cyclone crossed the east coast of India south of the Hooghly River, one of the streams that constitute the delta of the River Ganges, shortly after 10 A.M. As the cyclone entered the narrowing waterway the water level rose until it became a towering forty-foot-high wall. Its height had been raised to a maximum by the arrival of high tide before noon on the same day. Everything was washed away in its path as the water swept inland. In the months that followed, the city, the surrounding area, and the harbor had to be rebuilt. Different parts of the world have different names and different definitions for the storms they experience. In Asia, a storm with speeds less than 39 mph is called a tropical depression. If the circulating speed is above 39 mph it is named a storm and, if above 73 mph, it is classified as a cyclone. The meteorological conditions in India are very different from the Caribbean. Winds are stronger, rainfall is heavier, and preparations for weather extremes were almost non-existent in the nineteenth century. Hence, there are records of huge losses of life and widespread damage to buildings from that period of history. Even today, as was seen when the Indonesian tsunami of 2004 struck India, many lives can be lost if preparations for coping with disasters are inadequate. A comparison of the Caribbean and Southeast United States storm environment with that of India helps to explain why India’s storms are enormously destructive. The first thing to note is the temperature difference. India lies south of the Tropic of Cancer while the Southeast United States is north of this line so water temperatures are generally higher in the waters around India. The winds, therefore, are able to carry greater volumes of water vapor at any given time and bring high levels of rain if they are moved over land. In the areas around Calcutta, especially in the mountainous regions north of it, the highest rainfall records in the world are found. Cherrapunji is a community 300 miles northeast of Calcutta and 4,000 feet in elevation, in the country of Bangladesh. It holds the world record for being the wettest place anywhere. Its average annual rainfall is 450 inches but many years have totals far beyond that figure. Calcutta’s rainfall is much less than Cherrapunji, even though it experiences the same winds, because its elevation is close to sea level. The second thing to note is the huge expanse of the Indian Ocean compared with the Caribbean and the equally massive extent of the landmass north of India. The air masses that build up over these areas are larger and denser than we find over either the Caribbean or the United States and, hence, their winds are stronger when storms or cyclones form. In October of 1737, the coastal area of the Bay of Bengal north and south of Calcutta was hit by a cyclone. Numerous ships in the waterways of the Ganges delta were destroyed and many thousands of Indians lost their lives. It was a similar story twenty-five years after the 1864 cyclone, and with similar devastating outcomes. This part of India will always be at risk as the huge air masses that move over it create storms and cyclones. At the same time, the benefits of the monsoon rains they bring are felt and welcomed all over India as they have sustained a human population of a billion. These seasonal winds, blowing toward the land of India from May to October, and blowing in the opposite direction for the rest of the year, bring large volumes of rain. Indian farmers depend on them for their livelihood and if they are delayed for any reason, and sometimes this happens due to unusual behavior of air masses, the result can be disastrous. Many of the accounts of famines in India are related to a major delay in the arrival of the monsoon rains. For various reasons, often because forests were cut down, the ground does not preserve much of the water that comes in the wet season. Even in Cherrapunji there is an inadequate amount of water in the dry season and the people have had to travel great distances, on foot, to find clean drinkable water. In addition to their unfamiliarity with India’s physical environment, British colonial officers had to cope with the limited knowledge of meteorology when they had to cope with cyclones. Temperature and pressure measurements and reports from ships at sea constituted almost all of their available data and the ships at sea in 1864 were often sailing ships. Powerful cyclones could completely destroy both ships and their cargoes so captains were always eager to detect approaching storms and report their findings to shore by wireless telegraph. 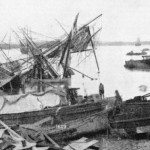 One vessel, the Proserpine, was caught in the1864 Calcutta storm as it made its way out of port and found itself in the spiral winds of the cyclone almost two hundred miles from its center. Within an hour of entering the storm area, the captain of the Proserpine discovered that the winds were too strong for his ship, even though it was a steamboat, so he just let it be carried along under the force of the winds. Three hours later he noted that the winds had greatly increased in strength, perhaps because his ship had been drawn further into the storm area. The ship began to roll violently and the engine-room started filling with water. Over the following six hours every member of the ship’s crew was busy pumping out water. At the same time, everything that could possibly be spared was thrown overboard in order to make the ship as light as possible and so minimize its resistance to the waves that swept over it. In the hold there was a quantity of wooden beams, part of the cargo, and they too would have been thrown overboard if they had been lighter. As the ship lurched backwards and forwards the cargo of beams also moved and the captain was afraid that they would make a hole in the ship’s hull. Twenty-four hours after their first encounter with the storm, the Proserpine entered calmer water beyond the storm. It had barely managed to stay afloat. Everyone was exhausted after all the hours of pumping out water and they could imagine conditions in and around Calcutta when such a powerful cyclone would reach land. That scene of devastation has already been described. Cherapunji is not in Bangladesh it’s in Meghalaya, an Indian state.